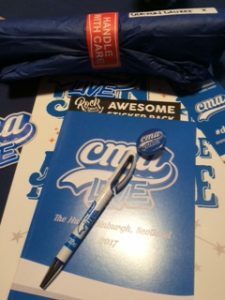 A week ago I was in Edinburgh for the CMA Live 2017 event. I’d heard a lot about the previous year’s event from my colleagues in Newcastle, so I already knew there was a risk of FOMO if I didn’t get a ticket. Attending a two day business conference in another city is expensive and an investment you need to consider carefully. However, as I’m always trying to learn more about content creation and marketing, and a lot of my ideal customers were attending, I decided it would be massively beneficial to my business. I’ve spent a lot of time over the last 18 months honing my offerings, trying some things and discarding others, and I’m now happy that my niche brings together 20 years as a published writer and my experience as a transcriptionist to give high quality, useable repurposing services to busy, successful professionals. CMA Live gave me opportunities to explain what I do and to get ideas on what to do next. How Does CMA Live Actually Work? Good question. The format was four keynote speakers, at the start and end of each day, with six other presentations and “lightning talks” from CMA members (there is also a membership community) talking about aspects of their business, often very personally and honestly. 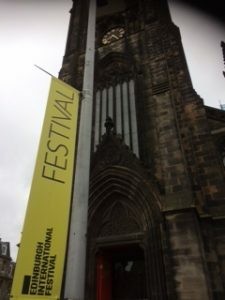 The venue was a deconsecrated church in the heart of Edinburgh’s Old Town, The Hub. I have to apologise for the poor quality photos – I was so busy taking notes and Tweeting that my pictures fell by the wayside! There were plenty of coffee breaks to process what we’d heard, as well as the chance to chat over breakfast butties and lunch. On top of that, there were social events taking place both evenings, as well as the night before the conference. I met so many lovely people, who I hope to stay in touch with. There was a Twitter list of delegates and speakers, as well as a Slack channel, so you really got to know everyone. I was lucky that there was a big contingent from the North East, but I would have survived by myself. I kept spotting people I recognised from their social media pics, which was a little weird! The speakers were around most of the time, and were friendly and approachable. While even the most famous of business owners or celebrities are human at the end of the day, seeing them queue up for soup with everyone else made them a lot more accessible. What Did I Learn at CMA Live? 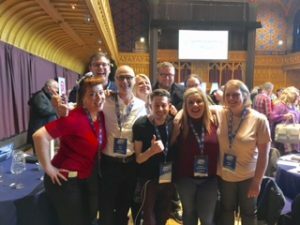 There are some fantastic posts by other delegates on what they got from CMA Live. My North East pals Richard and Kathryn have both summed up their own experiences, and new friends Anne and John have given detailed breakdowns of the speakers – be warned, John’s is a War and Peace style epic, which he wrote as he went along! I had no idea what to expect, but I wanted to hear some new ideas from people right at the forefront of content marketing and creation. But what I learned from everybody who spoke was about the importance of authenticity, of having confidence in yourself and what you do, and to engage with your audience, who are always your first priority, so they love you and trust you and want to do business with you (and only you). I learned that you have to be consistent and always improving and developing in order to stay ahead. It’s also ok to ask for help, and to lean on those around you for support and advice (and a kick in the pants!) It’s important to share your knowledge and help others learn and grow too. And… as well as all the learning, I appeared on my first podcast! Colin Gray was interviewing delegates throughout the event, and I shared my tips on content repurposing. I hadn’t realised it was being broadcast live, so I’m glad I didn’t choke. You can check all the interviews out here. You can find out more about the Content Marketing Academy here. It was great to meet you there Gudrun and fab to read your takeaways. Thanks for the mention too. There was so much enthusiasm and inspiration in the room. I can’t wait for next year!